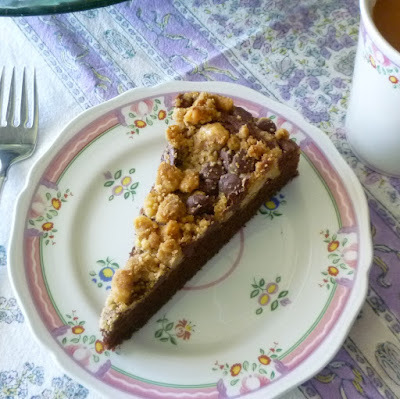 A couple of years ago I made a chocolate and browned butter streusel-topped coffee cake for my breakfast stash. (For new visitors, a little background: I always try to keep a supply of portioned coffee cakes, scones, muffins, etc. in my freezer for my daily breakfast treat.) And although the cake was very good, it needed a bit of tweaking. I planned to pursue just that...but other things took priority. This wasn't for a class...and I didn't think chocolate cake for breakfast would find a very wide audience on my blog (sometimes I feel like I'm pushing the outer limits of what most people consider to be acceptable by encouraging the regular consumption of cake for breakfast). 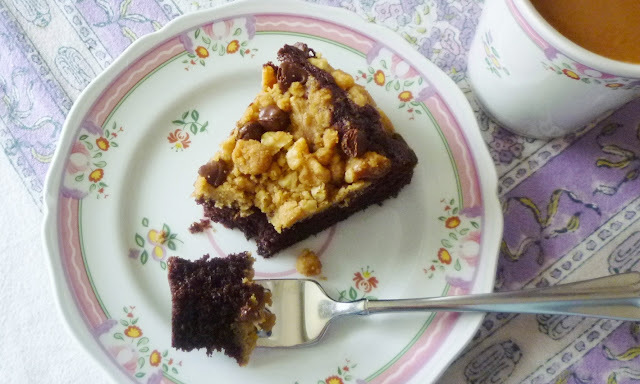 Consequently, the chocolate coffee cake fell off of my radar. But a few weeks ago, when an article crossed my Facebook feed about a new study touting the benefits of dessert (specifically chocolate cake) for breakfast, I remembered it. I should probably admit that I tend to take the latest nutrition/ benefits-of-a-certain-food studies with a massive grain of salt. It is much less complicated...and probably healthier and less stressful in the long run...to ignore the latest thing in diet and nutrition wisdom and just consume a wide variety of foods...emphasizing those that are fresh, home cooked and unprocessed. But who doesn't love a study that supports what they are already doing? 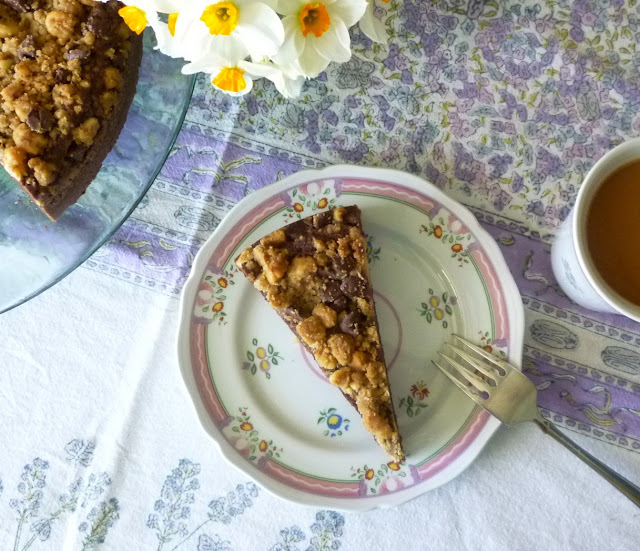 Besides, this particular study reminded me to go back and finish my recipe for chocolate coffee cake...and at the same time helped me to feel less self-conscious about sharing the recipe (and the fact that I eat chocolate cake for breakfast ) here. The coffee cake I came up with is nothing more than one of my favorite sour cream coffee cakes reinvented as a chocolate cake. 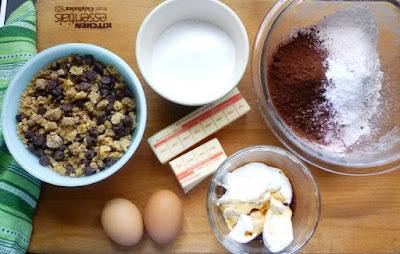 To do this I substituted Dutch-processed cocoa for 20% of the flour. (I have made the cake with regular, American-style—non-alkalized—cocoa and it worked just fine....but the flavor isn't quite as intense.) I discovered that the cocoa substitution seemed to make the cake a bit dry, so I increased the butter by a small amount. Not only did this give the cake the added moisture I was looking for, it amplified the chocolate flavor as well. For the streusel, I used the browned butter streusel that tops a favorite pumpkin cake. 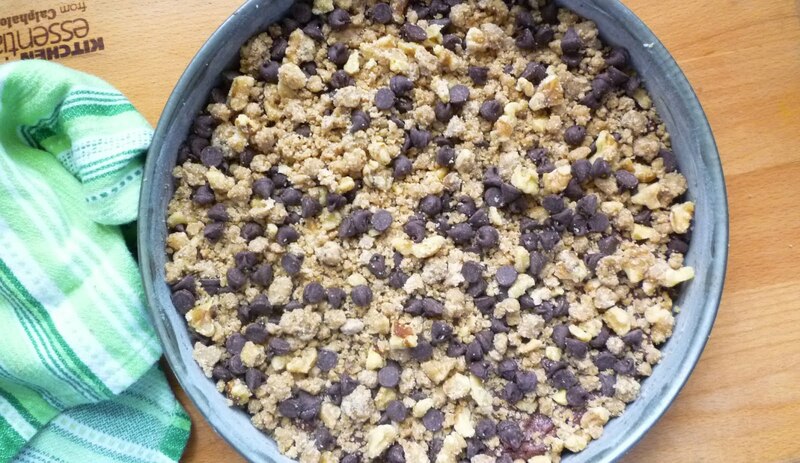 Finally, I added some chocolate chips to the streusel, figuring that if I was going to have chocolate cake for breakfast, I should just go all out. 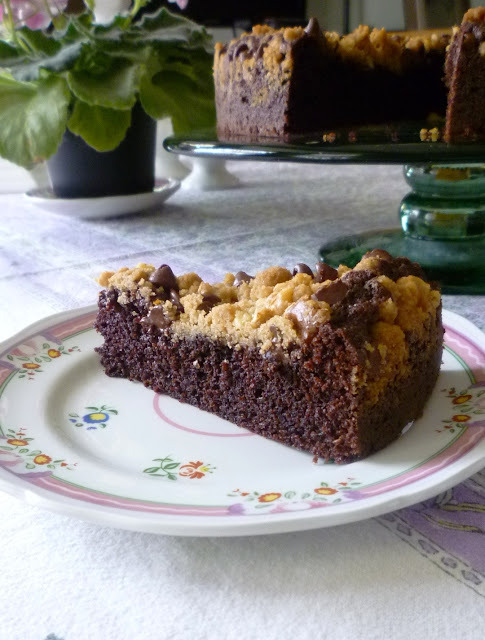 Over the past couple of weeks I have derived immense pleasure from my slice of chocolate breakfast cake. Accompanied by a strong cup of half & half-laced coffee and served with a big bowl of fresh fruit and homemade (full fat) yogurt, it is a happy way to start the day. 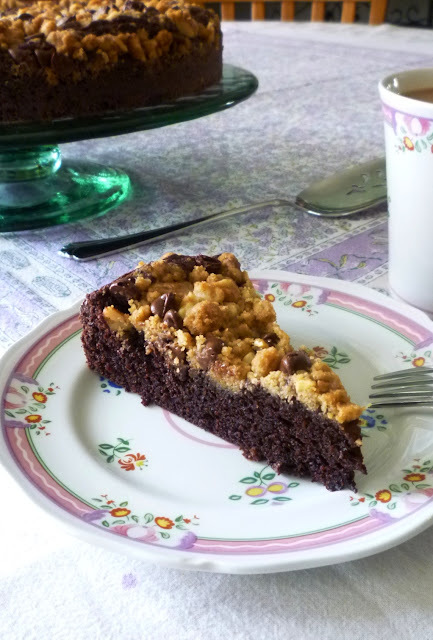 But if a chocolate cake seems to be more than you can face first thing in the morning, I still think you should make this cake. 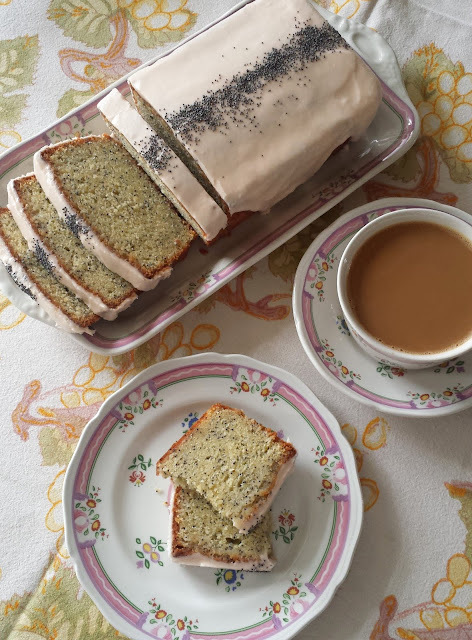 It would be perfect with your mid-morning or afternoon coffee...or tea. And I think it would go over very well at a potluck. If that potluck happens to be a brunch, so much the better. It would even make a nice casual dessert...accompanied by a big scoop of ice cream or a blob of whipped cream. In short...no matter what your occasion...if the occasion calls for a casual chocolate cake, this cake would be an excellent choice (no matter what the nutrition experts have to say...). Combine the flour, brown sugar, & salt in a medium-sized bowl. Combine the browned butter and vanilla and drizzle over the dry ingredients; stir with a fork until the ingredients are combined and have formed clumps. Stir in the walnuts and chill until ready to use. When ready to use, crumble the topping up with your hands and stir in the chocolate chips. Combine the flour, cocoa, salt, baking powder and baking soda in a small bowl. Sift onto a sheet of wax paper (cocoa tends to have clumps) and set aside. Cream the butter and sugar until light and fluffy. Beat in the eggs, one at a time. Beat in the vanilla. Fold in the flour mixture in three additions, alternating with the sour cream, beginning and ending with the flour mixture. Spread the batter in a greased and floured 10-inch round or 9x9-inch square baking pan. Scatter the streusel evenly over the cake. Bake in a 350° oven until golden and a toothpick inserted in the center comes out clean—30 to 40 minutes. Serves 12. Note: To “brown” butter, place the butter in a small saucepan set over medium heat. As the butter begins to sputter and pop, whisk occasionally. The butter solids will begin to turn brown. When the solids are a deep golden brown and the butter has a pleasantly nutty aroma, transfer the butter to another container to stop the cooking process. Yummy! I'd eat a piece of that. You know I love that browned butter streusel. What could be better than to have it with chocolate?! ;) A GF version might have to come about. I thought you might appreciate this! You'll have to let me know if you develop a gluten free version.